Takiya is truly indulgent tempura – luxury ingredients in generous helpings at a price that is clearly worth it. 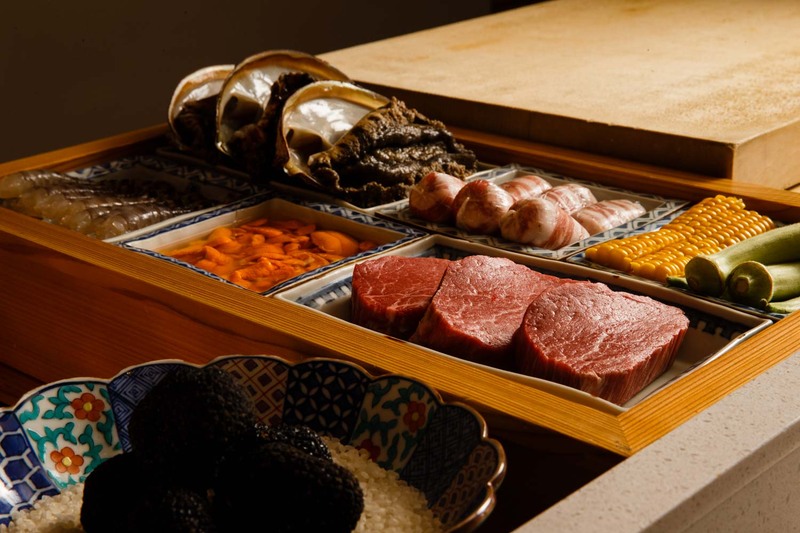 Premium wagyu and truffles are among many unconventional tempura items that feature in an artist’s palette of colourful and enticing morsels that keep most guests waiting more than four moths for a seat. The chef’s golden touch and generous spirit transforms tempura into a total dining experience pairing luxury ingredients with premium wines and spirits, making for an unforgettable evening. Just steps off the busy cobblestone shopping street of Azabu Juban and up one flight of stairs, a sage-colored noren hangs just long enough to create a divide from the hustle and bustle of outside, but short enough that a guest need not feel intimidated about pulling it back to peek inside. 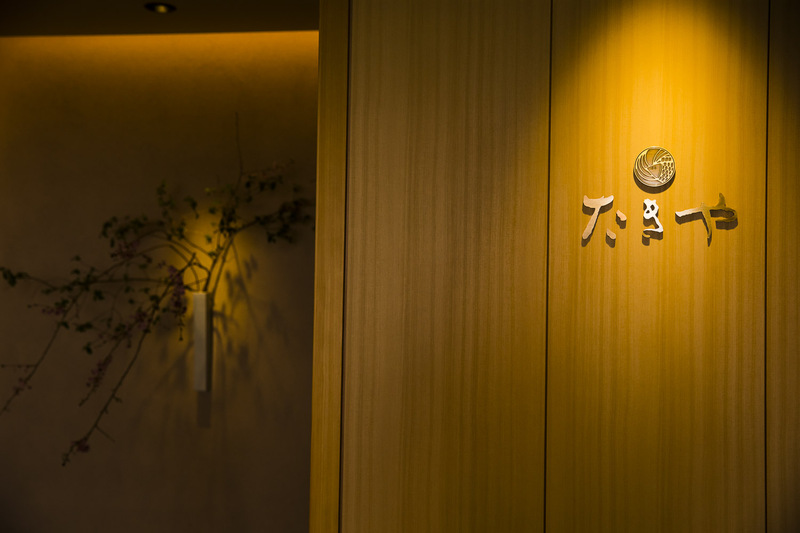 It bears the image of a sea bream, showing a deep connection with the sea, and beside it a wooden plaque with the hiragana letters for Takiya, the name of the family catering business passed on to Chef Kasamoto from his own chef father. There is a purity about the shrine-like interior, complete with the blessing of the gods above the chef’s head as he works: the shiny copper dome of the frying pot; the granite floor providing grounding; the pale slatted wood windows with paper screens offering light and a sense of space; and a plump ivory crane, a symbol of longevity, cradling a posy of flowers. 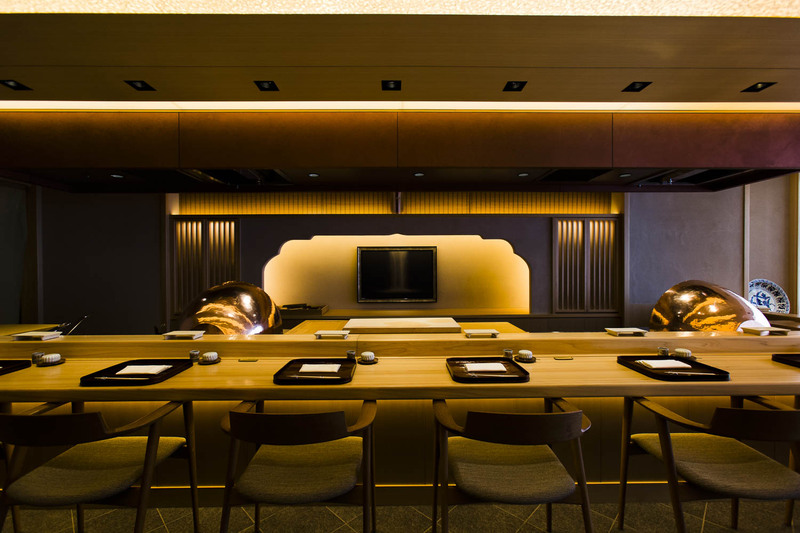 The counter for eight is adorned with a selection of pieces in tin, lacquer, wood, leather, ceramic and gold – an exhibit of artistry that works beautifully together. The hallway leads past a giant stepping stone into a private room for four to six guests, for added privacy or a meal with small children. A plump and aromatic towel to refresh you arrives just before a series of condiments for the dishes soon to come: a perfectly shaped snowball-like scoop of grated daikon, and three homemade salts – deep pink and plum-flavored for a hint of acid, aromatic curry-accented yellow, and matcha green salt for a touch of bitterness. Added as you like to any of the tempura delicacies, one more salt – a perfectly balanced pure white salt that has been farmed in the salt pans of Slovenia for more than 300 years – is delicious with all the ingredients. Each course is a contrast of taste, temperature and texture. 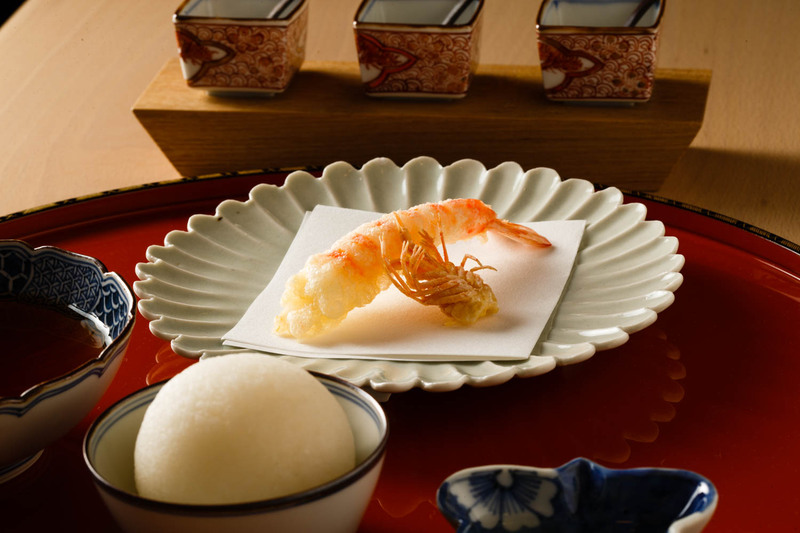 A crisp tempura shrimp, accompanied by crunchy shrimp legs, does a somersault into the perfect position on a ceramic pedestal, which physically elevates each morsel, showing respect for the produce and the art of tempura. 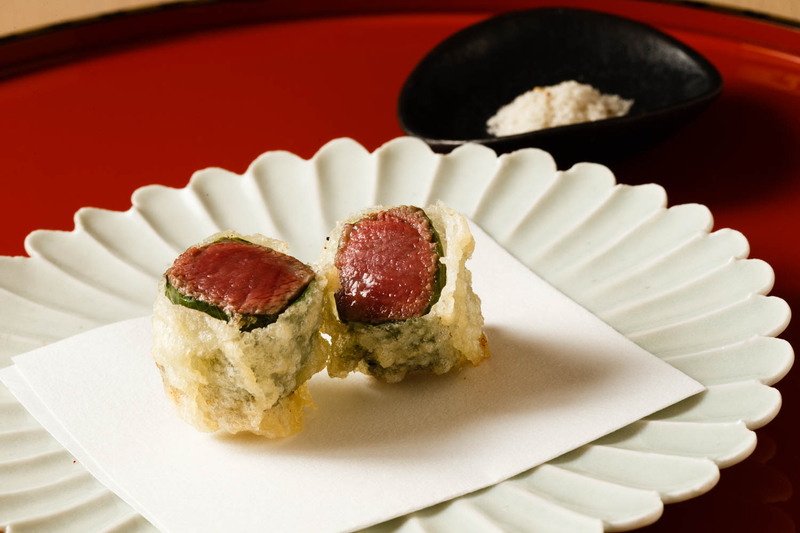 The signature shiso-wrapped steak tempura dipped in truffle salt has unbelievable flavor and an incredibly crispy texture that contrasts with the natural juices of the succulent steak. 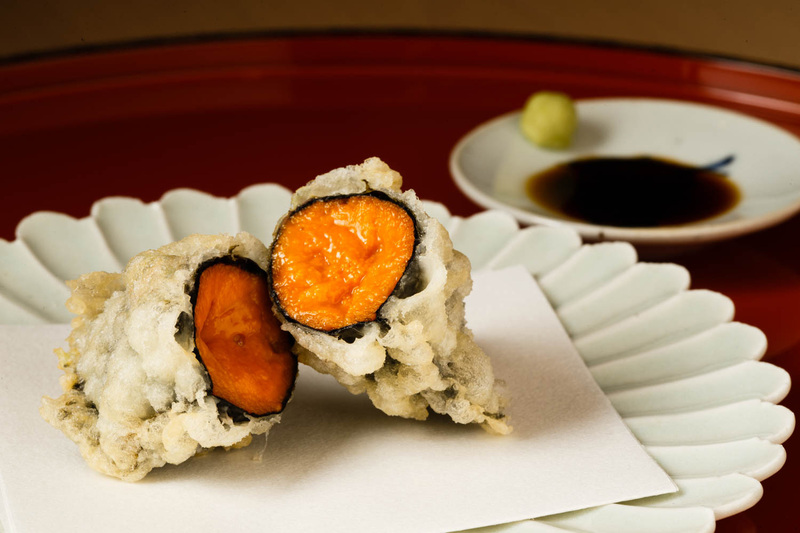 Uni sea urchin in nori with wasabi soy sauce fills your mouth with velvety deliciousness. 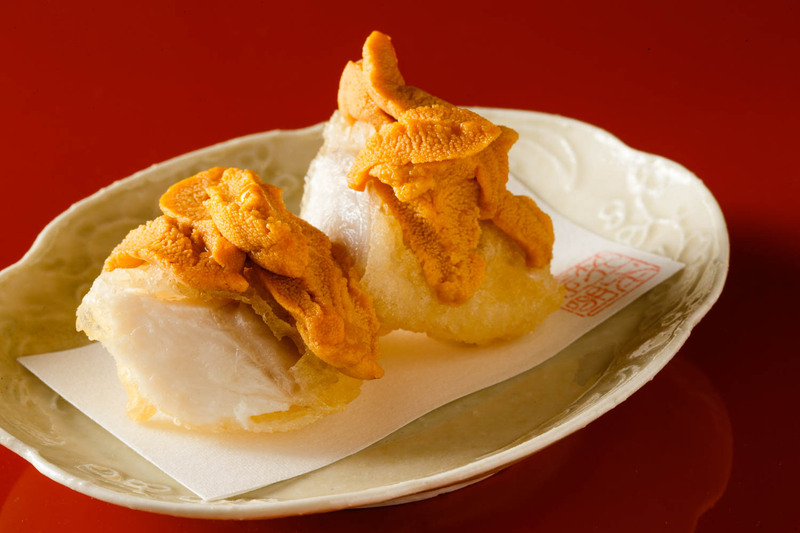 And the texture and heat contrast is outstanding in the tempura nodoguro (black-throated sea perch) topped with uni which melts like a sauce in the mouth. Kasamoto’s personal connections with farmers help secure unique vegetables like white okra from Yamaguchi, served alongside seasonal vegetables like the fresh yellow corn, which bursts with sweetness. For a refreshing interlude, the layered fresh and grilled tomato salad topped with fresh onion and crab has a deep, sweet caramel flavor. 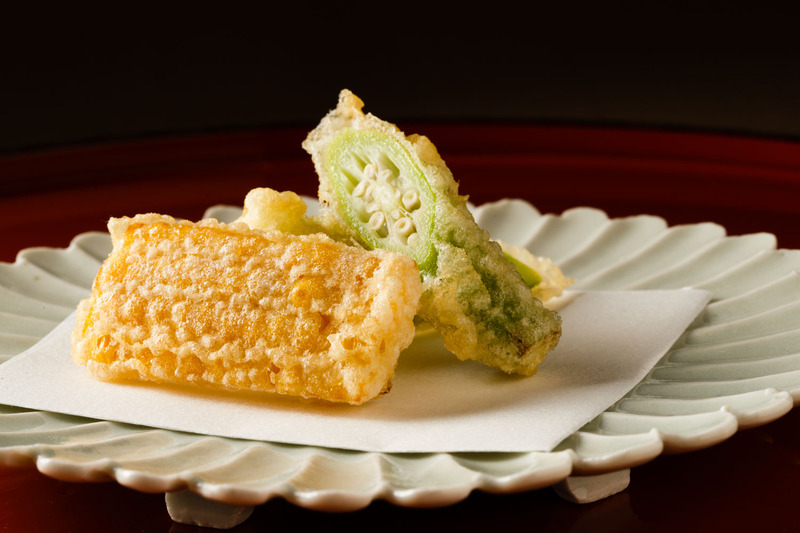 Cooked ever so briefly in 100% safflower oil, Kasamoto attempts to go ever thinner and finer with his tempura crust to enhance the innate flavors of the ingredients nestled within. From the moment you are seated, guests are greeted by a cornucopia of blessings from the mountains and the sea – abalone, okra, corn, uni, beef, bite-sized pork parcels – predominantly sourced directly from farmers and fishermen. Kasamoto visits Tsukiji to fill the gaps in his produce, searching for the ideal ingredients for tempura, and chooses not to restrict himself by settling on a single producer or region. Rather, he constantly searches for the best each season, excitedly heading off on visits to producers around Japan. He loves collaborating with farmers to perfect produce for tempura, and finds the visits have a deeper philosophical purpose – through the connections he forges, Kasamoto finds himself. Tatsuaki Kasamoto appears in a white shirt, black tie, crisp ironed black pants and a pristine white chef’s coat – at once a chef and a service man. Working with his team in precision movements, the lovely, chatty man with a good sense of humor laughs about how funny it sounds to answer that his favorite tempura dish is kisu, making it sound like he loves kisses. Kasamoto was born into a cooking family in Yamaguchi Prefecture. His father ran a catering business that served hundreds of guests in a sitting. As a teenager, Kasamoto helped out and worked for pocket money, taking himself out into the ocean to dive for sazae turban shells that were often part of the elaborate meals. He headed to Osaka for formal training at Tsuji Culinary School at the age of 18, and joined the kitchens of Kitcho after graduation, serving highly refined cuisine to discerning guests for four years. Having always intended to take over the family business, Kasamoto then sought experience serving large groups of guests, and joined the Ritz Carlton group. After working in kaiseki and generalist washoku cuisine, he was asked to become the tempura chef. Opposed at first, Kasamoto got hooked on the challenge of attempting what few tempura chefs had done before – finding new ways to serve tempura. He saw changes happening on the sushi scene and felt tempura could do with some new ideas, and that the world would be better if more people could have that mouthwatering experience of biting into freshly prepared hot, crisp tempura. He shifted from Osaka to Tokyo, and in 2012-2015 served as the head chef at the Ritz Carlton, giving him the challenging but highly rewarding opportunity to work with chefs of all cuisines, backgrounds, and nationalities. Then in August 2015, he opened his own tempura restaurant, to immediate high acclaim. The comment of “pretty good” from his father during his first visit to Takiya may seem rather lackluster, but to Kasamoto it was the ultimate stamp of approval from his most important critic. 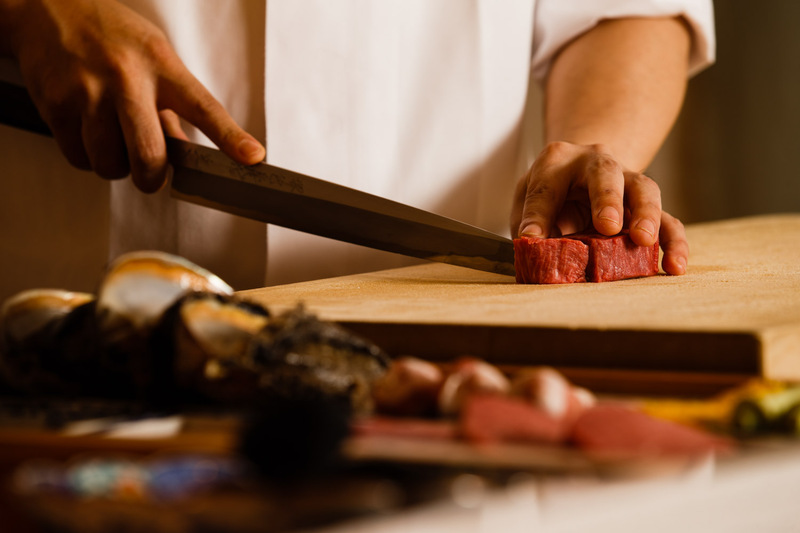 Thanks to the efforts of sushi chefs, the world now understands sushi culture better than ever before and appreciates the artistry behind the delicious morsels that arrive on your plate à la minute. Kasamoto sees the same potential for tempura cuisine and would like people around the globe to enjoy the dining experience offered by tempura. He laments that somewhere along the way, tempura stopped evolving. He wants to share the goodness of it and show diners that, when prepared before your eyes and devoured crispy and hot, tempura makes for a sumptious dining experience. Takiya carries an impressive array of drinks to accompany the cuisine. 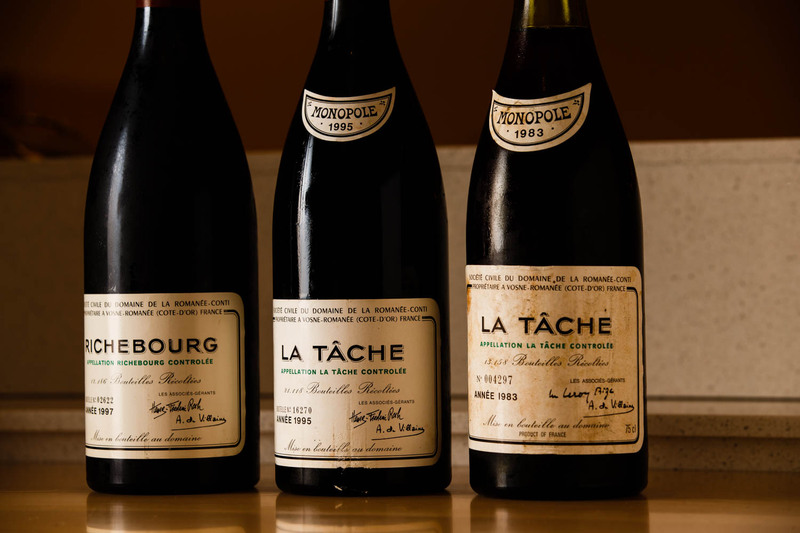 The cellar is filled with the best in premium wines – champagne, white and red – in particular Burgundy Pinot Noirs like Richebourg, Romanée Conti, and La Tâche, as well as the full-bodied reds of the Napa Valley, such as Opus. If your palate desires, there is also freshly poured beer from a golden tap and wide selection of whisky. 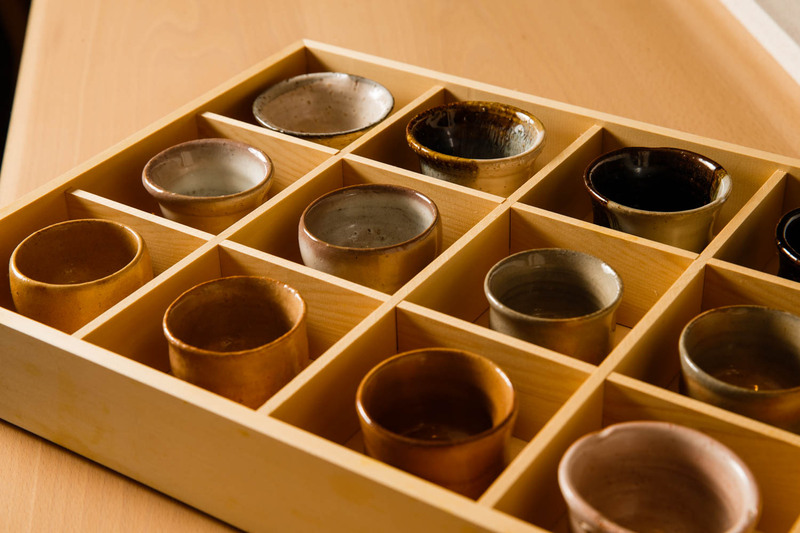 Sake lovers choose from a beautiful collection of Hagi-yaki sake cups in grey, rose, brown and deep cream, with perfect delicate edges for sipping. For Chef Kasamoto, it’s not about pairing with the food, but rather allowing guests to choose their favorites and savor the best that the world of wine and spirits-making has to offer. 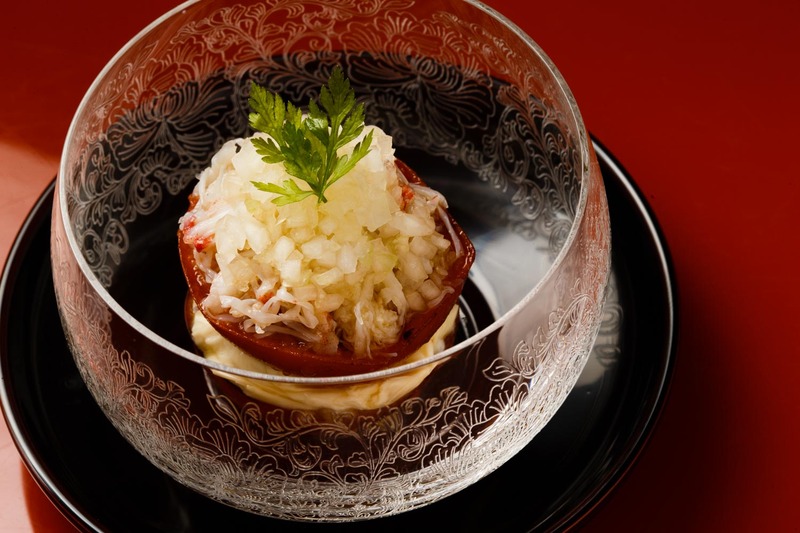 In fact, the drinks have inspired several of Kasamoto’s creations such as a tempura parcel of Kirishima pork-wrapped Gruyere cheese – delectable!